The National Chairman of Peoples Democratic Party, (PDP), Uche Secondus has warned INEC and security agencies in the country not to plunge the country into irredeemable crisis. 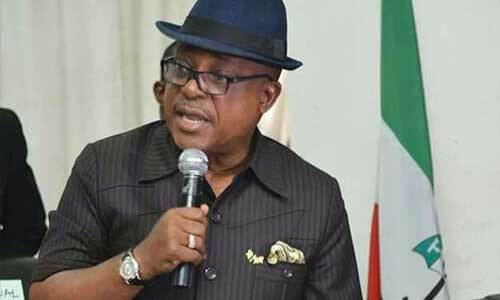 Speaking while campaigning for votes for PDP candidates in Cross River State, Secondus said, “We will advise, both INEC and security agencies to be very very careful so that they don’t plunge this country into irredeemable crisis. “They must not rigged the elections, we heard about the statement by the Kaduna State Governor about the body bags. We want to let the Kaduna State Governor know that he cannot kill anybody anymore. He further said that the other day, the party was in Katsina State, the crowd was so much that the party (PDP) was sure that APC have lost the election, “We will collect Katsina, don’t rig this elections, election is about people coming out to votes and our votes must counts”. The National Chairman lamented that his party was so worried that some state’s institutions including the Nigeria Police Force, Military and Central Bank of Nigeria are about to be destroyed. “Don’t allow APC destroy you because of one man, they should not destroy the Nigeria Police Force, they should not destroy the Military, the Police must not take side, the Military must not take side, if they take side, it would be terrible for our country but God forbid, we are looking for peace, but they are looking for war and body bags. “Nigerians know that the current President is not in charge of government, we need President who would take responsibility of government and ensure that he defence and protect our people. “We had from our intelligence that they are looking for money everywhere, they know that NNPC is a valley of corruption, so their money is coming from there for campaign, they also know that some businessmen want to use central Bank to launder money for their campaign, we want to warn these institutions, if they do, the eyes of the camera are watching them and we will make it public when time comes,” he stated.